Identity is more than something cosmetic or superficial. Identity is sacred because it translates into real world utility: our identities unify us and that unity empowers us. But an essential component of any identity is the ability to define it, because part of knowing who we are means knowing who we are not. Without the ability to define and distinguish ourselves from others, we are unidentifiable. 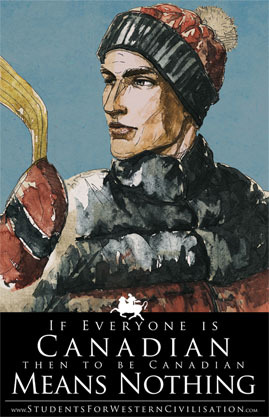 The aim of Canadian multiculturalism is to expand the definition of Canadian to include everyone and everything. According to this policy, Canadian identity is not defined by a particular norm, standard or set of characteristics, instead it assumes that all peoples and cultures are equally Canadian, none of them any more or less than the next. Thus, under multiculturalism, “Canadian” refers to everything, and is, thereby, defined by nothing. This has profound implications for how we understand ourselves. If everyone is Canadian, then to be Canadian becomes meaningless, and with that resulting disintegration of Canadian identity, powerful alternative identities are rising up to fill its void. These alternative identities are taking shape around that category that most distinguishes us in a multicultural society: our ethnicity. Ignoring this reality isn’t polite, it’s irresponsible. These are valid and pertinent questions with which we as citizenry have the duty to engage. Multiculturalism and a Canadian National Identity are mutually exclusive. Both can not exist simultaneously and one will inevitably succumb to the other. SWC’s February 2019 poster campaign is intended to put forth and highlight this critique of multiculturalism and to foster a necessary debate.